Why are some doctors asking you if you have any guns at home? And, what will happen if you tell them it’s none of their business? When you go to a doctor’s office, you expect that the doctor will ask you some health-related questions, about such things as weight, exercise, sleep and so on. Doctors adhere to this “standard of care”—the term used for what an average, prudent doctor would do—because that’s what they are trained to do, and because it’s necessary in order to avoid malpractice lawsuits. But some doctors are expanding the standard to include asking you about firearms ownership and telling you that all guns in the home should be unloaded and locked up, with the ammunition locked separately. That begs some questions, such as: What will happen to you if you disclose this personal information? What if you refuse to answer? In San Francisco, a man honestly answered his doctor’s questions about whether there were guns in the home. A short time later, Child Protective Services arrived at the residence, and demanded to be let inside so that they could inspect whether the guns were locked up. In Ocala, Fla., Amber Ullman took her 4-month-old baby to a pediatrician for shots and a checkup. When she refused to answer the gun question, the doctor terminated the relationship and the mother was given 30 days to find a new pediatrician. In the Chicago suburb of Oak Lawn, a family brought their 16-year-old son to Advocate Children’s Hospital for a tonsil infection. While taking the son’s medical history, the doctor asked the parents to step out of the room. Then the doctor asked the teenager if there were any guns in his home. 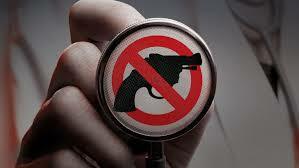 (John Kass, “Doctor Probes Teen On Guns In The Home,” Chicago Tribune, Jan. 23, 2013.) Although the family does not own firearms, the mother was furious at the invasion of privacy. After all, her son was not there because of suicidal risk or other psychiatric issues. The News report focused on an Oklahoma woman’s story about going to a clinic for a case of the flu. According to the woman, the nurse asked about family health history, such as diabetes and cancer—and then asked the woman if she had any guns at home. The News article explains that the gun question is most commonly asked in the course of taking a patient’s medical history. It is especially common for Medicaid and Medicare patients. EMRs can be helpful when a specialist wants to look at your lifetime medical history from your general practitioner. EMRs allow insurance companies and the government to process claims more efficiently. When EMRs include the gun question, though, it means that the health care system is being used to accumulate records of who owns guns. This is gun owner registration.